(Bloomberg) -- The Indonesian rupiah jumped through a key resistance level, leading gains in emerging Asian currencies as a dovish pivot by the Federal Reserve spurred inflows into risk assets. The bellwether currency rose as much as 1.2 percent to 13,965 to a dollar, the strongest since June. Bonds rallied, with the 10-year yield falling 10 basis points to 8.06 percent. The contrast in Wednesday’s comments between Bank Indonesia and the Fed added further fuel to the rupiah’s rally, with BI Governor Perry Warjiyo saying it will maintain a hawkish stance even after raising rates by 175 basis points last year. Indonesia is often seen as a bellwether of EM sentiment in Asia, with foreigners owning around 40 percent of its debt. 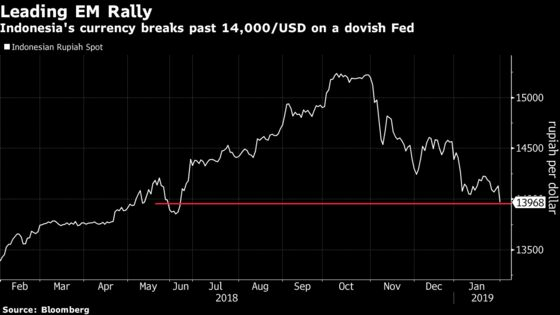 “IDR has clearly benefited from the dovish Fed speak overnight which can support bond inflows in particular,” said Dushyant Padmanabhan, a currency strategist at Nomura Holdings Inc. in Singapore. Global funds have snapped up $2.3 billion of Indonesian stocks and bonds in January as last year’s rate hikes by the central bank and steps by the government helped restore investor confidence. The advance in China’s yuan is also helping to bolster the rupiah, according to Vishnu Varathan, head of economics and strategy at Mizuho Bank Ltd. in Singapore. The next levels to watch are 13,800, and if there is a sustained break, then 13,500, he said.